For the mainly Turkish Shia religious group, see Alevism. For the royal house of Morocco, who practice Sunni Islam, see Alaouite dynasty. For other uses, see Alawi (disambiguation). The Alawis, also rendered as Alawites (Arabic: علوية‎ Alawīyah), are a sect of the Ghulat branch of Islam,[better source needed] primarily centred in Syria. The eponymously-named Alawites revere Ali (Ali ibn Abi Talib), considered the first Imam of the Twelver school. However, they are considered to be ghulat by orthodox Shia Islam. The group is believed to have been founded by Ibn Nusayr during the 9th century and fully established as a religion. For this reason, Alawites are sometimes called Nusayris (Arabic: نصيرية‎ Nuṣayrīyah), though the term has come to be used as a pejorative in the modern era. Another name, "Ansari" (Arabic: انصارية‎ Anṣārīyah), is believed to be a mistransliteration of "Nusayri". Today, according to Mehrdad Izady, Alawites represent 17.2 percent of the Syrian population, an increase from 11.8 percent in 2010 and are a significant minority in the Hatay Province of Turkey and northern Lebanon. There is also a population living in the village of Ghajar in the Golan Heights. They are often confused with the Alevis of Turkey. Alawites form the dominant religious group on the Syrian coast and towns near the coast which are also inhabited by Sunnis, Christians, and Ismailis. Alawites identify as a separate ethnoreligious group. The Qur'an is only one of their holy books and texts, and their interpretation thereof has very little in common with the Shia Muslim interpretation but in accordance with the early Batiniyya and other Muslim ghulats sects. Alawite theology and rituals break from mainstream Shia Islam in several remarkable ways. For one the Alawites drink wine as Ali's transubstantiated essence in their rituals; while other Muslims abstain from alcohol, Alawites are encouraged to drink socially in moderation. Finally, they also believe in reincarnation. Alawites have historically kept their beliefs secret from outsiders and non-initiated Alawites, so rumours about them have arisen. Arabic accounts of their beliefs tend to be partisan (either positively or negatively). However, since the early 2000s, Western scholarship on the Alawite religion has made significant advances. At the core of Alawite belief is a divine triad, comprising three aspects of the one God. These aspects, or emanations, appear cyclically in human form throughout history. The establishment of the French Mandate of Syria marked a turning point in Alawi history. It gave the French the power to recruit Syrian civilians into their armed forces for an indefinite period and created exclusive areas for minorities, including an Alawite State. The Alawite State was later dismantled, but the Alawites continued to be a significant part of the Syrian Armed Forces. 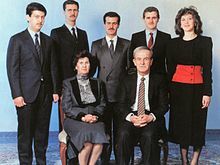 Since Hafez al-Assad took power through the 1970 Corrective Movement, the government has been dominated by a political elite led by the Alawite Al-Assad family. During the Islamist uprising in Syria in the 1970s and 1980s, the establishment came under pressure. Even greater pressure has resulted from the Syrian Civil War. In older sources, Alawis are often called "Ansaris". According to Samuel Lyde, who lived among the Alawites during the mid-19th century, this was a term they used among themselves. Other sources indicate that "Ansari" is simply a Western error in the transliteration of "Nusayri". However, the term "Nusayri" had fallen out of currency by the 1920s, as a movement led by intellectuals within the community during the French Mandate sought to replace it with the modern term "Alawi". They characterised the older name (which implied "a separate ethnic and religious identity") as an "invention of the sect's enemies", ostensibly favouring an emphasis on "connection with mainstream Islam"—particularly the Shia branch. As such, "Nusayri" is now generally regarded as antiquated, and has even come to have insulting and abusive connotations. The term is frequently employed as hate speech by Sunni fundamentalists fighting against Bashar al-Assad's government in the Syrian civil war, who use its emphasis on Ibn Nusayr in order to insinuate that Alawi beliefs are "man-made" and not divinely inspired. "In actual fact, the name 'Alawī' appears as early as in an 11th century Nuṣayrī tract (…). Moreover, the term 'Alawī' was already used at the beginning of the 20th century. In 1903 the Belgian-born Jesuit and Orientalist Henri Lammens (d. 1937) visited a certain Ḥaydarī-Nuṣayrī sheikh Abdullah in a village near Antakya and mentions that the latter preferred the name 'Alawī' for his people. Lastly, it is interesting to note that in the above-mentioned petitions of 1892 and 1909 the Nuṣayrīs called themselves the 'Arab Alawī people' (ʿArab ʿAlevī ṭāʾifesi) 'our ʿAlawī Nuṣayrī people' (ṭāʾifatunā al-Nuṣayriyya al-ʿAlawiyya) or 'signed with Alawī people' (ʿAlevī ṭāʾifesi imżāsıyla). This early self-designation is, in my opinion, of triple importance. Firstly, it shows that the word 'Alawī' was always used by these people, as ʿAlawī authors emphasize; secondly, it hints at the reformation of the Nuṣayrīs, launched by some of their sheikhs in the 19th century and their attempt to be accepted as part of Islam; and thirdly, it challenges the claims that the change of the identity and name from 'Nuṣayrī' to 'ʿAlawī' took place around 1920, in the beginning of the French mandate in Syria (1919–1938)." The Alawites are distinct from the Alevi religious sect in Turkey, although the terms share a common etymology and pronunciation. The origin of the genetics of Alawites is disputed. Local folklore suggests that they are descendants of the followers of the eleventh Imam, Hasan al-Askari (d. 873) and his pupil, Ibn Nusayr (d. 868). During the 19th and 20th centuries, some Western scholars believed that Alawites were descended from ancient Middle Eastern peoples such as the Arameans, Canaanites, Hittites, and Mardaites. Many prominent Alawite tribes are also descended from 13th century settlers from Sinjar. The "Tetrarchy of the Nazerini" refers to the western region, between of the Orontes and the sea, which consists of a small mountain range called An-Nusayriyah Mountains bordered with a valley running from south-east to north-west known as "Al-Ghab plain"; the region was populated by a portion of Syrians, who were called Nazerini. However, scholars are reluctant to link between Nazerini and Nazarenes. Yet, the term "Nazerini" can be possibly connected to words which include the Semitic triliteral root n-ṣ-r such as the subject naṣer in Eastern Aramaic which means "keeper of wellness". Ibn Nusayr and his followers are considered the founders of the sect. After the death of the Eleventh Imam, al-Askari, problems emerged in the Shia Community concerning his succession, and then Ibn Nusayr claimed to be the Bab and Ism of the deceased Imam and that he received his secret teachings. Ibn Nusayr and his followers development seems to be one of many other early Ghulat mystical Islamic sects, and were apparently excomunicated by the Shia representatives of the 12th Hidden Imam. The Alawi sect later was organised during the Hamdanid dynasty by a follower of Muhammad Ibn Nusayr known as Al-Khaṣībī, who died in Aleppo about 969 AD, after a rivalty with the sect Ishaqiyya, who claimed also to have the doctrine of Ibn Nusayr. In 1032 Al-Khaṣībī's grandson and pupil, al-Tabarani, moved to Latakia (then controlled by the Byzantine Empire). Al-Tabarani influenced the Alawite faith through his writings and by converting the rural population of the Syrian Coastal Mountain Range. According to Bar Hebraeus, many Alawites were killed when the Crusaders initially entered Syria in 1097; however, they tolerated them when they concluded they were not a truly Islamic sect. Two prominent Alawite leaders in the following centuries, credited with uplifting the group, were Shaykhs al-Makzun (d. 1240) and al-Tubani (d. 1300), both originally from Mount Sinjar in modern Iraq. By executing the orders of his majesty, the decisions and recommendations were implemented, and all the Syrian villages, especially the villages of Nusayris, were destroyed until the jungle of the bridge (Jisr al-Shughur) and the gate of the Eagle (probably Bab al-Nasr), to Shaizar and Wadi Khaled (in Akkar District), until the victory was written for us. And the religion of Islam, the "Ottoman" of course, settled in the Levant; and these Syrians were left homeless and would not live on the land of the great Sultan Selim; their remnants have been eaten by the monsters of the mountains and crocodiles of the jungle (Al-Ghab plain), long live our Sultan on soft lands, God bless the right .. God curse them in every book, and the light of God perpetuates on you. The Ottoman Empire oppressed the Alawites, attempting to convert them to Sunni Islam. The Alawis rose up against the Ottomans on several occasions, and maintained their autonomy in their mountains. The sect, vital in itself, was clannish in feeling and politics. One Nosairi would not betray another, and would hardly not betray an unbeliever. Their villages lay in patches down the main hills to the Tripoli gap. They spoke Arabic, but had lived there since the beginning of Greek letters in Syria. Usually they stood aside from affairs, and left the Turkish Government alone in hope of reciprocity. During the 18th century, the Ottomans employed a number of Alawite leaders as tax collectors under the iltizam system. Between 1809 and 1813, Mustafa Agha Barbar, the governor of Tripoli, attacked the Kalbiyya Alawites with "marked savagery." 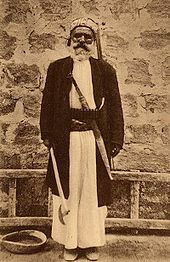 Some Alawites supported Ottoman involvement in the Egyptian-Ottoman Wars of 1831–1833 and 1839–1841, and had careers in the Ottoman army or as Ottoman governors. By the mid-19th century, the Alawite people, customs and way of life were described by Samuel Lyde, an English missionary among them, as suffering from nothing except a gloomy plight. Early in the 20th century the mainly-Sunni Ottoman leaders were bankrupt and losing the political power, and the Alawites were poor peasants. Alawites were not allowed to testify in court until after World War I and the dissolution of the Ottoman Empire. "Alawite state of Latakia", supported by French colonial power. 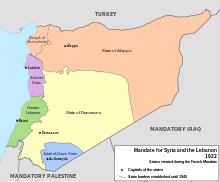 After the end of World War I and the fall of the Ottoman Empire, Syria and Lebanon were placed by the League of Nations under the French Mandate for Syria and the Lebanon. On 15 December 1918 Alawite leader Saleh al-Ali called for a meeting of Alawite leaders in the town of Al-Shaykh Badr, urging them to revolt and expel the French from Syria. When French authorities heard about the meeting, they sent a force to arrest Saleh al-Ali. He and his men ambushed and defeated the French forces at Al-Shaykh Badr, inflicting more than 35 casualties. After this victory al-Ali began organising his Alawite rebels into a disciplined force, with its own general command and military ranks. The Al-Shaykh Badr skirmish began the Syrian Revolt of 1919. Al-Ali responded to French attacks by laying siege to (and occupying) al-Qadmus, from which the French had conducted their military operations against him. In November, General Henri Gouraud mounted a campaign against Saleh al-Ali's forces in the An-Nusayriyah Mountains. His forces entered al-Ali's village of Al-Shaykh Badr, arresting many Alawi leaders; however, Al-Ali fled to the north. When a large French force overran his positions, he went underground. However, despite these instances of opposition, the Alawites greatly favoured French rule and sought its continuation beyond the mandate period. When the French began to occupy Syria in 1920, an Alawite State was created in the coastal and mountain country comprising most Alawite villages; the French justified this by citing differences between the "backwards" mountain people and the mainstream Sunnis. The division also intended to protect the Alawite people from more-powerful majorities, such as the Sunnis. The French also created microstates, such as Greater Lebanon for the Maronite Christians and Jabal al-Druze for the Druze. Aleppo and Damascus were also separate states. Under the Mandate many Alawite chieftains supported a separate Alawite nation, and tried to convert their autonomy into independence. The French encouraged Alawites to join their military forces, in part to provide a counterweight to the Sunni majority (which was more hostile to their rule). According to a 1935 letter by the French minister of war, the French considered the Alawites and the Druze the only "warlike races" in the Mandate territories. The region was home to a mostly-rural, heterogeneous population. The landowning families and 80 percent of the population of the port city of Latakia were Sunni Muslim; however, in rural areas 62 percent of the population were Alawite peasants. There was considerable Alawite separatist sentiment in the region, evidenced by a 1936 letter signed by 80 Alawi leaders addressed to the French Prime Minister which said that the "Alawite people rejected attachment to Syria and wished to stay under French protection". Among the signatories was Sulayman Ali al-Assad, father of Hafez al-Assad. Even during this time of increased Alawite rights, the situation was still so bad for the group that many women had to leave their homes to work for urban Sunnis. In May 1930, the Alawite State was renamed the Government of Latakia in one of the few concessions by the French to Arab nationalists before 1936. Nevertheless, on 3 December 1936 the Alawite State was re-incorporated into Syria as a concession by the French to the National Bloc (the party in power in the semi-autonomous Syrian government). The law went into effect in 1937. In 1939, the Sanjak of Alexandretta (now Hatay) contained a large number of Alawites. The Hatayan land was given to Turkey by the French after a League of Nations plebiscite in the province. This development greatly angered most Syrians; to add to Alawi contempt, in 1938 the Turkish military went into İskenderun and expelled most of the Arab and Armenian population. Before this, the Alawite Arabs and Armenians comprised most of the province's population. Zaki al-Arsuzi, a young Alawite leader from Iskandarun province in the Sanjak of Alexandretta who led the resistance to the province's annexation by the Turks, later became a co-founder of the Ba'ath Party with Eastern Orthodox Christian schoolteacher Michel Aflaq and Sunni politician Salah ad-Din al-Bitar. After World War II, Sulayman al-Murshid played a major role in uniting the Alawite province with Syria. He was executed by the Syrian government in Damascus on 12 December 1946, only three days after a political trial. Syria became independent on 17 April 1946. In 1949, after the 1948 Arab–Israeli War, Syria experienced a number of military coups and the rise of the Ba'ath Party. In 1958, Syria and Egypt were united by a political agreement into the United Arab Republic. The UAR lasted for three years, breaking apart in 1961 when a group of army officers seized power and declared Syria independent. A succession of coups ensued until, in 1963, a secretive military committee (including Alawite officers Hafez al-Assad and Salah Jadid) helped the Ba'ath Party seize power. In 1966 Alawite-affiliated military officers successfully rebelled and expelled the Ba’ath Party old guard followers of Greek Orthodox Christian Michel Aflaq and Sunni Muslim Salah ad-Din al-Bitar, calling Zaki al-Arsuzi the "Socrates" of the reconstituted Ba'ath Party. In 1970 Air Force General Hafez al-Assad, an Alawite, took power and instigated a "Corrective Movement" in the Ba'ath Party. The coup of 1970 ended the political instability which had existed since independence. Robert D. Kaplan compared Hafez al-Assad's coming to power to "an untouchable becoming maharajah in India or a Jew becoming tsar in Russia—an unprecedented development shocking to the Sunni majority population which had monopolized power for so many centuries". In 1971 al-Assad declared himself president of Syria, a position the constitution at the time permitted only for Sunni Muslims. In 1973 a new constitution was adopted, replacing Islam as the state religion with a mandate that the president's religion be Islam, and protests erupted. In 1974, to satisfy this constitutional requirement, Musa as-Sadr (a leader of the Twelvers of Lebanon and founder of the Amal Movement, who had unsuccessfully sought to unite Lebanese Alawites and Shiites under the Supreme Islamic Shiite Council) issued a fatwa that Alawites were a community of Twelver Shiite Muslims. Under the authoritarian, secular Assad government, religious minorities were tolerated more than before but political dissidents were not. In 1982, when the Muslim Brotherhood mounted an anti-government Islamist insurgency, Hafez Assad staged a military offensive against them known as the Hama massacre. During the Syrian Civil War, the Alawites have suffered as a result of their support for the Assad government against the mainly Sunni opposition, with up to a third of young Alawite men killed in the increasingly sectarian conflict. Many Alawites fear a negative outcome for the government in the conflict would result in an existential threat to their community. In May 2013, SOHR stated that out of 94,000 killed during the war, at least 41,000 were Alawites. In April 2017, a pro-opposition source claimed 150,000 young Alawites had died. Alawites celebrating at a festival in Baniyas, Syria during World War II. Alawites and their beliefs have been described as “secretive” (Yaron Friedman, for example, in his scholarly work on the sect, has written that the Alawi religious material quoted in his book came only from “public libraries and printed books” since the “sacred writings” of the Alawi “are kept secret”[Note 1]); some tenets of the faith are kept secret from most Alawi and known only to a select few, they have therefore been described as a mystical sect. Alawite beliefs have never been confirmed by their modern religious authorities. Alawites tend to conceal their beliefs (taqiyya) due to historical persecution. Alawis are self-described as a community of "true believers". Alawites "celebrate Mass, including consecration of bread and wine." Alawite doctrine incorporates Islamic, Gnostic, neo-Platonic, Christian and other elements and has, therefore, been described as syncretic. According to an article appeared on The Telegraph, the 1995 edition of The Oxford Encyclopedia of the Modern Islamic World allegedly describes them as "extremist" Shi’ia whose "religious system separates them from Sunni Muslims," but also states that they "celebrate Mass, including consecration of bread and wine." Alawites hold that they were originally stars or divine lights that were cast out of heaven through disobedience and must undergo repeated reincarnation (or metempsychosis) before returning to heaven. They can be reincarnated as Christians or others through sin and as animals if they become infidels. In addition, they believe that God might have incarnated twice; the first incarnation was Joshua who conquered Canaan, and the second was the fourth Caliph, Ali. They also believe in intercession of certain legendary saints such as Khidr (Saint George) and Simeon Stylites. Yaron Friedman and many researches of Alawi doctrine write that the founder of the religion, Ibn Nusayr, did not necessarily believe he was representative of a splinter, rebel group of the Shias, but rather believed he held the true doctrine of the Shias, and most of the aspects who are similar to Christianity are considered more a coincidence and not a direct influence from it, as well as other external doctrines who were actually popular among Shia Esoteric groups in Basra in the 8th century. According to Friedman and other scholars, the Alawi movement started as many other mystical ghulat sects with an explicit concentration in an allegorical and esoteric meaning of the Quran and other mystical practices, and not as a pure syncretic sect, thought later they embraced some other practices as they believed all religions had the same Batin core. Journalist Robert F. Worth argues that the idea that the Alawi religion as a branch of Islam is a rewriting of history made necessary by the French colonialists abandonment of the Alawi and departure from Syria. Worth describes the “first ... authentic source for outsiders about the religion” (written by Soleyman of Adana – a 19th-century Alawi convert to Christianity who broke his oath of secrecy on the religion) explaining that the Alawi (according to Soleyman) deified Ali, venerated Christ, Muhammad, Plato, Socrates, and Aristotle, and held themselves apart from Muslims and Christians, whom they considered heretics. In 1936, six Alawi notables fearing persecution of their religion, petitioned the French colonialists not to merge their Alawi enclave with the rest of Syria, insisting that “the spirit of hatred and fanaticism embedded in the hearts of the Arab Muslims against everything that is non-Muslim has been perpetually nurtured by the Islamic religion.” According to Worth, later fatwas declaring Alawi to be part of the Shia community were by Shia clerics “eager for Syrian Patronage” from Syria's Alawi president Hafez al-Assad who was eager for Islamic legitimacy in the face of the hostility of Syria's Muslim majority. The modern period has witnessed tremendous changes in the definition of the ʿAlawīs and the attitude towards them in the Muslim world. ... In order to end their long isolation, the name of the sect was changed in the 1920s from Nusạyriyya to ʿAlawiyya'. By taking this step, leaders of the sect expressed not only their link to Shīʿism, but to Islam in general. According to Peter Theo Curtis, the Alawi religion underwent a process of "Sunnification" during the years under Hafez Al Assad's rule, so that Alawites became not Shia, but effectively Sunni. Public manifestation or “even mentioning of any Alawite religious activities” was banned, as was any Alawite religious organizations or “any formation of a unified religious council” or a higher Alawite religious authority. “Sunni-style” mosques were built in every Alawite village, and Alawi were encouraged to perform Hajj. The Sunni Grand Mufti of Jerusalem Haj Amin al-Husseini issued a fatwa recognizing them as part of the Muslim community in the interest of Arab nationalism. However, Athari Sunni scholars such as the Syrian historian Ibn Kathir have categorised Alawites as kuffar (infidels) and mushrikeen (polytheists), in their writings; with Ibn Taymiyya arguably being the most virulent anti-Alawite in his fatwas accusing them of aiding the Crusader and Mongol enemies of the Muslims. Other Sunni scholars, such as Al-Ghazali, also approved of violence against Alawites, whom he considered as non-Muslims. Benjamin Disraeli, in his novel Tancred, also expressed the view that Alawites are not Muslims. Historically, Twelver Shia scholars (such as Shaykh Tusi) didn't consider Alawites as Shia Muslims while condemning their heretical beliefs. Ibn Taymiyyah also pointed out that Alawites were not Shi'ites. The Christian elements in the Nusayri religion are unmistakable. They include the concept of trinity; the celebration of Christmas, the consecration of the Qurbana, that is, the sacrament of the flesh and blood which Christ offered to his disciples, and, most important, the celebration of the Quddas (a lengthy prayer proclaiming the divine attributes of Ali and the personification of all the biblical patriarchs from Adam to Simon Peter, founder of the Church, who is seen, paradoxically, as the embodiment of true Islam). Barry Rubin has suggested that Syrian leader Hafez al-Assad and his son and successor Bashar al-Assad pressed their fellow Alawites "to behave like 'regular Muslims', shedding (or at least concealing) their distinctive aspects". During the early 1970s a booklet, al-`Alawiyyun Shi'atu Ahl al-Bait ("The Alawites are Followers of the Household of the Prophet") was published, which was "signed by numerous 'Alawi' men of religion", described the doctrines of the Imami Shia as Alawite. Additionally, there has been a recent movement to unite Alawism and the other branches of Twelver Islam through educational exchange programs in Syria and Qom. Some sources have discussed the "Sunnification" of Alawites under the al-Assad regime. Joshua Landis, director of the Center for Middle East Studies, writes that Hafiz al-Assad "tried to turn Alawites into 'good' (read Sunnified) Muslims in exchange for preserving a modicum of secularism and tolerance in society". On the other hand, Al-Assad "declared the Alawites to be nothing but Twelver Shiites". In a paper, "Islamic Education in Syria", Landis wrote that "no mention" is made in Syrian textbooks (controlled by the Al-Assad regime) of Alawites, Druze, Ismailis or Shia Islam; Islam was presented as a monolithic religion. We are Alawi Muslims. Our book is the Qur'an. Our prophet is Muhammad. The Ka`ba is our qibla, and our Dīn (religion) is Islam. 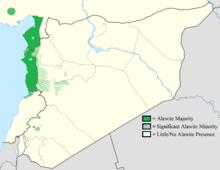 Map showing the distribution (2012) of Alawites in the Northern Levant. Alawites have traditionally lived in the Coastal Mountain Range along the Mediterranean coast of Syria. Latakia and Tartus are the region's principal cities. They are also concentrated in the plains around Hama and Homs. Alawites also live in Syria's major cities, and are estimated at about 12 percent of the country's population (2.6 million, out of a total population of 22 million). There are four Alawite confederations — Kalbiyya, Khaiyatin, Haddadin, and Matawirah — each divided into tribes based on their geographical origins or their main religious leader, such as Ḥaidarīya of Alī Ḥaidar, and Kalāziyya of Sheikh Muḥammad ibn Yūnus from the village Kalāzū near Antakya. Those Alawites are concentrated in the Latakia region of Syria, extending north to Antioch (Antakya), Turkey, and in and around Homs and Hama. Before 1953 Alawites held specifically-reserved seats in the Syrian Parliament, in common with all other religious communities. After that (including the 1960 census) there were only general Muslim and Christian categories, without mention of subgroups, to reduce sectarianism (taifiyya). To avoid confusion with the Alevis, the Alawites call themselves Arap Alevileri ("Arab Alevis") in Turkish. The term Nusayrī, previously used in theological texts, has been revived in recent studies. 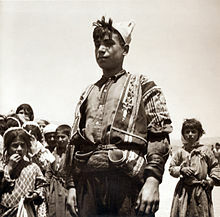 In Çukurova, Alawites are known as Fellah and Arabuşağı (although the latter is considered offensive) by the Sunni population. A quasi-official name used during the 1930s by Turkish authorities was Eti Türkleri ("Hittite Turks"), to conceal their Arabic origins. Although this term is obsolete, it is still used by some older people as a euphemism. The exact number of Alawites in Turkey is unknown; there were 700,000 in 1970, suggesting about 1,500,000 in 2009. As Muslims, they are not recorded separately from Sunnis. In the 1965 census (the last Turkish census where informants were asked their mother tongue), 700,000 people in the three provinces declared their mother tongue as Arabic; however, Arabic-speaking Sunnis and Christians were also included in this figure. Turkish Alawites traditionally speak the same dialect of Levantine Arabic as Syrian Alawites. 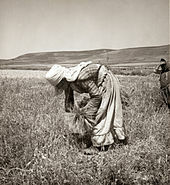 Arabic is preserved in rural communities and in Samandağ. Younger people in the cities of Çukurova and İskenderun tend to speak Turkish. The Turkish spoken by Alawites is distinguished by its accents and vocabulary. Knowledge of the Arabic alphabet is confined to religious leaders and men who have worked or studied in Arab countries. Alawites demonstrate considerable social mobility. Until the 1960s, they were bound to Sunni aghas (landholders) around Antakya and were poor. Alawites are prominent in the sectors of transportation and commerce and a large, professional middle class has emerged. Male exogamy has increased, particularly by those who attend universities or live in other parts of Turkey. These marriages are tolerated; however, female exogamy (as in other patrilineal groups) is discouraged. Alawites, like Alevis, have strong leftist political beliefs. However, some people in rural areas (usually members of notable Alawite families) may support secular, conservative parties such as the Democratic Party. Most Alawites feel oppressed by the policies of the Presidency of Religious Affairs in Turkey (Diyanet İşleri Başkanlığı). There are an estimated 40,000 Alawites in Lebanon, where they have lived since at least the 16th century. They are one of the 18 official Lebanese sects; due to the efforts of their leader, Ali Eid, the Taif Agreement of 1989 gave them two reserved seats in Parliament. Lebanese Alawites live primarily in the Jabal Mohsen neighbourhood of Tripoli and in 10 villages in the Akkar District, and are represented by the Arab Democratic Party. Their Mufti is Sheikh Assad Assi. The Bab al-Tabbaneh–Jabal Mohsen conflict between pro-Syrian Alawites and anti-Syrian Sunnis has affected Tripoli for decades. There are also about 3,900 Alawites living in the village of Ghajar, which is located on the border between Lebanon and the Israeli-occupied Golan Heights. In 1932 the residents of Ghajar were given the option of choosing their nationality, and overwhelmingly chose to be a part of Syria, which has a sizable Alawite minority. Before the 1967 Arab-Israeli War, the residents of Ghajar were counted in the 1960 Syrian census. Israel captured the Golan Heights from Syria, and after implementing Israeli civil law in 1981, the Alawite community chose to become Israeli citizens. Alawites in Syria speak a special dialect (part of Levantine Arabic) famous for the usage of letter (qāf). Lots of terms such as "qrd" (Akkadian: qar(r)ādu), means "hero" or "powerful one" in the Ugaritic language, are still being used especially by rural Alawites. Due to foreign occupation of Syria, the same dialect is characterized by multiple borrowings, mainly from Turkish; then French, especially terms used for imported inventions such as television, radio, elevator, etc. A 2006 study concluded that Alawites of Adana region had 33% of Haplogroup R1b, 2% of Haplogroup R1a, 1% of Haplogroup T-M184,. Another study in 2009 found that Alawites had 26.7% of Haplogroup J-M267. Wikimedia Commons has media related to Alawites. Wikisource has the text of the 1905 New International Encyclopedia article Ansaries. Bar-Asher, Meir M. (2003). "NOṢAYRIS". Encyclopaedia Iranica. Kazimi, Nibras. Syria Through Jihadist Eyes: A Perfect Enemy, Hoover Institution Press, 2010. ISBN 978-0-8179-1075-4. Friedman, Yaron (2010). The Nuṣayrī-ʿAlawīs : An Introduction to the Religion, History and Identity of the Leading Minority in Syria (PDF). Leiden, Boston: Brill. ISBN 978 90 04 178922. Retrieved 31 July 2016. Winter, Stefan. 2016. A history of the 'Alawis: From medieval Aleppo to the Turkish Republic. Princeton University Press. ^ Since the sacred writings of the Nuṣayrī-ʿAlawīs are kept secret by the members of the sect because of their sensitivity, it is important to note that the religious material used in this volume is only that which is accessible in public libraries and printed books. ^ James B. Minahan (30 May 2002). Encyclopedia of the Stateless Nations: Ethnic and National Groups Around the World A-Z. ABC-CLIO. p. 79. ISBN 978-0-313-07696-1. ^ Tej K. Bhatia; William C. Ritchie (23 January 2006). Bhatia, Tej K.; Ritchie, William C. (eds.). The Handbook of Bilingualism (illustrated, reprint ed.). John Wiley & Sons. p. 859. ISBN 978-0-631-22735-9. ^ Cassel, Matthew. "Syria strife tests Turkish Alawites". ^ "Lebanese Allawites welcome Syria's withdrawal as 'necessary'". The Daily Star. 30 April 2005. ^ "Lebanon's Alawi: A Minority Struggles in a 'Nation' of Sects". Al Akhbar English. 8 November 2011. Retrieved 6 July 2012. ^ Ghassan Hage (2002). Arab-Australians today: citizenship and belonging (Paperback ed.). Melbourne University Publishing. p. 40. ISBN 0-522-84979-2. ^ "Handbook to Life in the Medieval World, 3-Volume Set - Madeleine Pelner Cosman, Linda Gale Jones - Google Książki". ^ Izady, Michael. "Syria: Ethnic Shift, 2010-mid 2018". gulf2000.columbia.edu. ^ "Journey to the End of Islam - Michael Knight - Google Książki". ^ "Islamic State: The Digital Caliphate - Abdel Bari Atwan - Google Książki". ^ Clymer, R. Swinburne (1 April 2003). Initiates and The People Part 2, May 1929 to June 1930. Kessinger Publishing. ISBN 978-0-7661-5376-9. Retrieved 6 July 2012. ^ a b c d Howse, Christopher (5 August 2011). "Secretive sect of the rulers of Syria". The Daily Telegraph. Retrieved 31 July 2016. ^ See, Alkan, N. (2012) and the references cited therein. Alkan, N. Fighting for the Nuṣayrī Soul: State, Protestant Missionaries and the ʿAlawīs in the Late Ottoman Empire, Die Welt des Islams, 52 (2012) pp. 23-50. ^ "Erdogan, Iran, Syrian Alawites, and Turkish Alevis". The Weekly Standard. 29 March 2012. Retrieved 6 July 2012. ^ The Plain of Saints and Prophets: The Nusayri-Alawi Community of Cilicia ... - Gisela Procházka-Eisl, Stephan Procházka. Harrassowitz Verlag. 11 August 2010. ISBN 978-3-447-06178-0. Retrieved 6 July 2012. ^ Chisholm, Hugh, ed. (1911). "Nosairis" . Encyclopædia Britannica. 19 (11th ed.). Cambridge University Press. p. 821. ^ Lyde, Samuel (1860). The Asian mystery illustrated in the history, religion, and present state of ... Longman, Green, Longman and Roberts. p. 49. Retrieved 6 July 2012. ^ Journal of the Royal Anthropological Institute (London, 1911), p.241. ^ Mordechai Nisan (1 January 2002). Minorities in the Middle East: A History of Struggle and Self-Expression, 2d ed. McFarland. pp. 114–15. ISBN 978-0-7864-5133-3. ^ Matti Moosa (1987). Extremist Shiites: The Ghulat Sects. Syracuse University Press. pp. 256, 270. ISBN 978-0-8156-2411-0. ^ Delphi Complete Works of Pliny the Elder. Delphi Classics. 2015. p. 23. ^ Edme Mentelle (1792). Encyclopédie méthodique. Géographie ancienne, par M. Mentelle, historiographe de monseigneur comte d'Artois, censeur royal, de l'Académie d'histoire de Madrid, de celle de Rouen (in French). chez Panckoucke. p. 199. ^ Ray Pritz (1988). Nazarene Jewish Christianity: From the End of the New Testament Period Until Its Disappearance in the Fourth Century. Brill Archive. p. 17-18. ISBN 9004081089. ^ John Jandora (2015). No Carpenter From Nazareth?. Llumina Press. p. 119. ISBN 9781625502506. ^ a b Halm, Heinz (2004). Shi'ism. Edinburgh University Press. p. 157. ISBN 978-0-7486-1888-0. Retrieved 17 January 2010. ^ a b Matti Moosa (1987). Extremist Shiites: The Ghulat Sects. Syracuse University Press. pp. 269–71. ISBN 978-0-8156-2411-0. ^ Matti Moosa (1987). Extremist Shiites: The Ghulat Sects. Syracuse University Press. pp. 270–1. ISBN 978-0-8156-2411-0. ^ Matti Moosa (1987). Extremist Shiites: The Ghulat Sects. Syracuse University Press. p. 275. ISBN 978-0-8156-2411-0. ^ "Ottoman Empire massacre against Alawites". Syrian Center for Studies. 9 May 2017. ^ "من "التلل" و"الأرمن" إلى عفرين: أردوغان حين يُعيد مذابح أجداده". Al Mayadeen (in Arabic). 1 February 2018. ^ a b c d "Alawi Islam". Globalsecurity.org. ^ Seale, Patrick. Asad of Syria: The Struggle for the Middle East. With the assistance of Maureen McConville. Berkeley: University of California Press, 1989, c1988. ^ T. E. Lawrence. Seven Pillars of Wisdom Archived 17 July 2007 at the Wayback Machine. Book 5, Chapter 58. ^ Matti Moosa (1987). Extremist Shiites: The Ghulat Sects. Syracuse University Press. p. 276. ISBN 978-0-8156-2411-0. ^ Winter, Stefan (1999). "La révolte alaouite de 1834 contre l'occupation égyptienne: perceptions alaouites et lecture ottomane". Oriente Moderno (in French). 79 (3): 60–71. ^ Winter, Stefan (2004). "The Nusayris before the Tanzimat in the Eyes of Ottoman Provincial Administrators, 1804–1834". In Philipp, Thomas; Schumann, Christoph (eds.). From the Syrian Land to the States of Syria and Lebanon. Würzburg: Ergon. pp. 97–112. ISBN 3-89913-353-6. ^ Matti Moosa (1987). Extremist Shiites: The Ghulat Sects. Syracuse University Press. p. 277. ISBN 978-0-8156-2411-0. ^ Field, Michael (1 March 1996). Inside the Arab World -. Harvard University Press. ISBN 978-0-674-45521-4. Retrieved 6 July 2012. ^ Stratfor (5 May 2011). "Making Sense of the Syrian Crisis". Stratfor. Retrieved 6 July 2012. ^ Kirkpatrick, David D. (3 September 2012). "Syrian Children Offer Glimpse of a Future of Reprisals". The New York Times. ^ a b c d Moosa, Matti (1987). Extremist Shiites: The Ghulat Sects. Syracuse University Press. pp. 282–283. ISBN 0-8156-2411-5. ^ Moubayed, Sami M. (2006). Steel & Silk: Men & Women Who Shaped Syria 1900–2000. Cune Press. pp. 363–364. ISBN 1-885942-41-9. ^ Daniel Pipes (1992). Greater Syria. Oxford University Press. pp. 166–8. ISBN 978-0-19-536304-3. ^ a b Kaplan, Robert (February 1993). "Syria: Identity Crisis". The Atlantic. ^ Longrigg, Stephen Hemsley. Syria and Lebanon Under French Mandate. London: Oxford University Press, 1958. ^ William W. Harris (2003). The Levant: a fractured mosaic. Markus Wiener Publishers. ISBN 978-1-55876-264-0. Retrieved 6 July 2012. ^ a b c d Khoury, Philip S. Syria and the French Mandate: The Politics of Arab Nationalism, 1920–1945. Princeton: Princeton University Press, 1987. ^ Daniel Pipes (1992). Greater Syria. Oxford University Press. p. 165. ISBN 978-0-19-536304-3. ^ Shambrook, Peter A. French Imperialism in Syria, 1927–1936. Reading: Ithaca Press, 1998. ^ Seale, Patrick. Asad, the Struggle for the Middle East. University of California Press, 1989, p.173. ^ Riad Yazbeck. "Return of the Pink Panthers? Archived 19 February 2012 at the Wayback Machine" Mideast Monitor. Vol. 3, No. 2, August 2008. ^ Ruth Sherlock (7 April 2015). "In Syria's war, Alawites pay heavy price for loyalty to Bashar al-Assad". The Daily Telegraph. Retrieved 15 July 2015. ^ YAROSLAV TROFIMOV (9 July 2015). "After Backing Regime, Syrian Minorities Face Peril". WSJ. Retrieved 15 July 2015. ^ "150,000 Alawites killed in 6-year Syria war". 20 April 2017. ^ "The 'secretive sect' in charge of Syria". BBC. 17 May 2012. Retrieved 14 January 2015. ^ a b "Syria's Alawites, a secretive and persecuted sect". Reuters. Retrieved 25 December 2012. ^ Lebanon: current issues and background, John C. Rolland (2003). Nova. 1 August 2003. ISBN 978-1-59033-871-1. Retrieved 25 December 2012. ^ Howse, Christopher (5 August 2011). "Secretive sect of the rulers of Syria". ISSN 0307-1235. Retrieved 16 December 2018. ^ Prochazka-Eisl, Gisela; Prochazka, Stephan (2010). The Plain of Saints and Prophets: The Nusayri-Alawi Community of Cilicia. p. 81. ISBN 3-447-06178-2. ^ Prochazka-Eisl, Gisela; Prochazka, Stephan (2010). The Plain of Saints and Prophets: The Nusayri-Alawi Community of Cilicia. p. 82. ISBN 3447061782. ^ Peters, F.E. (2009). The Monotheists: Jews, Christians, and Muslims in Conflict and Competition, Volume II. p. 321. ISBN 1400825717. ^ "The Alawites and Israel". Begin–Sadat Center for Strategic Studies. 4 May 2011. ^ David S. Sorenson (3 December 2013). An Introduction to the Modern Middle East: History, Religion, Political Economy, Politics. Westview Press. p. 64. ISBN 978-0-8133-4922-0. ^ Robert Brenton Betts (31 July 2013). The Sunni-Shi'a Divide: Islam's Internal Divisions and Their Global Consequences (illustrated ed.). Potomac Books, Inc. p. 29. ISBN 978-1-61234-522-2. ^ Daniel Pipes (1992). Greater Syria. Oxford University Press. p. 161. ISBN 978-0-19-536304-3. ^ Mordechai Nisan (1 January 2002). Minorities in the Middle East: A History of Struggle and Self-Expression, 2d ed. McFarland. p. 116. ISBN 978-0-7864-5133-3. ^ Charles George Herbermann (2005). Encyclopaedia of sects & religious doctrines, Volume 1 (3rd ed.). Cosmo Publications. pp. 15–16. ISBN 9788177559286. ^ Nanny M. W. de Vries; Jan Best. Thamyris. Rodopi. p. 290. ^ Ian Strathcarron (2012). Innocence and War: Mark Twain's Holy Land Revisited (illustrated, reprint ed.). Courier Corporation. p. 78. ISBN 978-0-486-49040-3. ^ "Syrian success story: A hated minority sect becomes the ruling class". New York Times. 26 December 1986. ^ "Syria crisis: Deadly shooting at Damascus funeral". BBC News. ^ Matti Moosa (1987). Extremist Shiites: The Ghulat Sects. Syracuse University Press. pp. 269–70. ISBN 978-0-8156-2411-0. ^ The Nusayris are more infidel than Jews or Christians, even more infidel than many polytheists. They have done greater harm to the community of Muhammad than have the warring infidels such as the Franks, the Turks, and others. To ignorant Muslims they pretend to be Shi’is, though in reality they do not believe in God or His prophet or His book…Whenever possible, they spill the blood of Muslims…They are always the worst enemies of the Muslims…war and punishment in accordance with Islamic law against them are among the greatest of pious deeds and the most important obligations.” – Ibn Taymiyyah, as quoted by Daniel Pipes (1992). Greater Syria. Oxford University Press. p. 163. ISBN 9780195363043. ^ Rubin, Barry (2007). The Truth about Syria. New York: Palgrave Macmillan. p. 49. ISBN 978-1-4039-8273-5. ^ Abd-Allah, Umar F. (1983). Islamic Struggle in Syria. Berkeley: Mizan Press. pp. 43–48. ISBN 0-933782-10-1. ^ "Turbulent history colors Syria's ruling Alawite Muslims' fight to keep power". China Post. 9 July 2012. Retrieved 25 December 2012. ^ McDonald-Gibson, Charlotte (18 February 2012). "Syrians flee their homes amid fears of ethnic cleansing". The Independent. ^ "It's Time to Engage Iran, Russia on Syria". al-monitor.com. Archived from the original on 10 April 2014. Retrieved 6 July 2012. ^ "Alawites: Between Politics and Clan Life". Center for Environmental and Social Development. ^ Muḥammad Amīn Ġālib aṭ-Ṭawīl (1979). Tārīḫ al-ʿAlawiyyīn. 3rd edition. Beirut. p. 529. ^ "ʿAlawite". Encyclopædia Britannica. Retrieved 17 January 2010. ^ State and rural society in medieval Islam: sultans, muqtaʻs, and fallahun. Leiden: E.J. Brill. 1997. p. 162. ISBN 90-04-10649-9. ^ Zoi Constantine. "Pressures in Syria affect Alawites in Lebanon – The National". The National. Abu Dhabi. Retrieved 6 July 2012. ^ "'Lebanese Allawites welcome Syria's withdrawal as 'necessary' 2005, The Daily Star, 30 April". ^ United Nations High Commissioner for Refugees (5 August 2008). "Refworld | Lebanon: Displaced Allawis find little relief in impoverished north". UNHCR. Retrieved 6 July 2012. ^ United Nations High Commissioner for Refugees (31 July 2008). "Refworld | Lebanon: Displaced families struggle on both sides of sectarian divide". UNHCR. Retrieved 6 July 2012. ^ "Lebanon Muslim leaders held a summit in Beirut | World News Live from Lebanon". LB: Ya Libnan. 21 July 2012. Retrieved 25 December 2012. ^ David Enders, McClatchy Newspapers (13 February 2012). "Syrian violence finds its echo in Lebanon | McClatchy". Mcclatchydc.com. Archived from the original on 3 June 2013. Retrieved 6 July 2012. ^ "A New Fence Is Added to a Border Town Already Split". The New York Times. 11 October 2006. ^ Bar, Zvi (10 May 2009). "Getting rid of Ghajar, Zvi Bar'el". Haaretz. Retrieved 25 December 2012. ^ Joshua Project. "Alawite in Israel". ^ Gregorio del Olmo Lete; Joaquín Sanmartín (2003). A Dictionary of the Ugaritic Language in the Alphabetic Tradition - Part One (PDF). Brill. p. 709. ISBN 90-04-12891 3. Archived from the original (PDF) on 30 December 2017. Retrieved 12 February 2018. ^ James Minahan (2002). Encyclopedia of the Stateless Nations: A-C. Greenwood Publishing Group. p. 80. ISBN 0313321094. ^ Lale Dönbak; Thomas Bajanowski; Bernd Brinkmann; Carsten Hohoff (2006). "Y-STR haplotypes in populations from the Eastern Mediterranean region of Turkey". Springer-Verlag. doi:10.1007/s00414-005-0076-4. ^ Chiaroni, Jacques; King, Roy J; Myres, Natalie M; Henn, Brenna M; Ducourneau, Axel; Mitchell, Michael J; Boetsch, Gilles; Sheikha, Issa; et al. (2010). "The emergence of Y-chromosome haplogroup J1e among Arabic-speaking populations". European Journal of Human Genetics. 18 (3): 348–353. doi:10.1038/ejhg.2009.166. PMC 2987219. PMID 19826455. This page was last edited on 24 April 2019, at 23:17 (UTC).